Boom 12,9 m to 60,0 m, six section TWIN-LOCKTM boom. 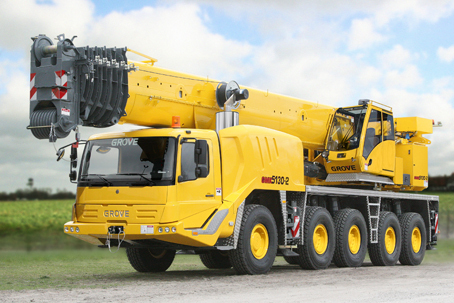 Maximum tip height: 63,0 m.
Cab Aluminium, tiltable (approx. 20°), full vision, safety glass, adjustable operator's seat with suspension, engine dependent heater. Armrest-integrated crane controls. Ergonomically arranged instrumentation and crane operating controls. Slewing Two slewing gears with axial piston fixed displacement motors, planetary gear, service brake and holding brake. Counterweight 8,5 tonnes, consisting of various sections (vehicle width 2.75 m). Hydraulic removal system. Engine Mercedes-Benz OM904LA, diesel, 4 cylinders, water cooled, turbocharged, 129 kW (175 HP) at 2200 rpm. (80/1269 EWG - fan rigid). Max. torque: 675 Nm at 1200 rpm. Fuel tank capacity: 200 l. Engine emission: EUROMOT / EPA / CARB (non road). Hydraulic system Two separate circuits, one axial piston variable displacement pump (load sensing), with electronic power limiting control and 1 gear pump for slewing. Thermostatically controlled oil cooler. Tank capacity: 840 l.
• Lattice extension, 26/32 m - includes 8m and 6m fixed non-offsettable sections plus11/18 m swingaway (see above). • Additional 31,6 tonnes counterweight (total counterweight 40,1 tonnes). • 3,6 m integrated 3 sheave heavy duty jib (max. 43 t). Cab 2-man-design, safety glass, driver and passenger seat with suspension, independent diesel air heater incl. 24h-timer. Complete instrumentation and driving controls. Air conditioning. Optional equipment • 10 x 8 x 10 (axle line 2, 3, 4 and 5 are driven). • Engine EUROMOT / EPA / CARB Tier 3 (non road).Mercedes-Benz OM 502 LA, 390 kW, max torque: 2400 Nm at 1200 rpm.